Stocked with an abundance of promising young pitching, the Atlanta Braves are open to dealing from that depth to acquire a young catcher who is productive at the plate, based on a Tweet from ESPN’s Jayson Stark. Still in the midst of a rebuilding project under new president of baseball operations John Hart, the Braves enter Thursday night’s contest with Philadelphia at 38-41, five games behind Washington in the National League East and five games out in the wild card standings. Atlanta’s farm system has made dramatic strides under Hart, adding names like right-handed pitcher Touki Toussaint, the 16th overall selection in the 2014 draft, from Arizona; right-hander Mike Foltynewicz, the 19th overall pick in the 2010 draft, from Houston; and right-hander Matt Wisler, who entered the 2015 campaign as the game’s 34th ranked prospect according to Baseball America; from San Diego. 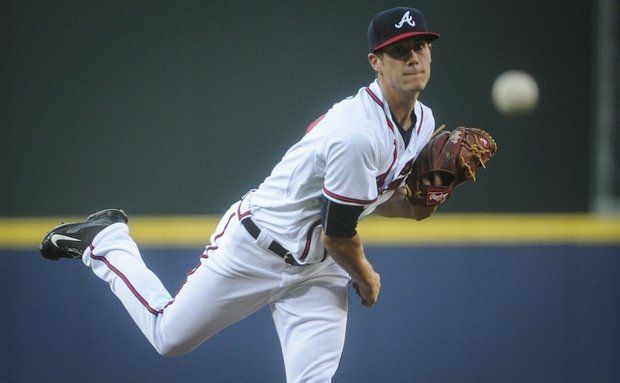 Wisler is already in the Braves starting rotation, joining a pair of 24-year-old homegrown arms in right-hander Julio Teheran and left-hander Alex Wood. Teheran, Wood and highly regarded right-hander Shelby Miller (who Hart landed from St. Louis in the Jason Heyward trade last offseason and is also 24) are expected to anchor the club’s rotation for the long term. The Braves could be open to dealing Toussaint, Foltynewicz, Wisler or another top prospect like 21-year-old right-hander Lucas Sims (No. 78 on MLB.com’s Top 100 Prospects List), 21-year-old left-hander Max Fried (who was drafted seventh overall by San Diego in 2012 and was acquired by Atlanta last offseason in the Justin Upton trade) or 22-year-old right-hander Tyrell Jenkins (a supplemental first rounder in 2010 who was included with Miller as the return in the Heyward deal). That Atlanta is reportedly interested in a young catcher could signal that the club does not believe top prospect Christian Bethancourt‘s bat will be productive enough at the big league level. The 24-year-old Bethancourt is respected for his strong throwing arm and plus defense, but he has a .223 batting average and a .528 OPS in 222 Major League plate appearances, including a .198 average (20-for-101) this season. The Braves recently optioned Bethancourt to Triple-A and are using a combination of veteran A.J. Pierzynski and Ryan Lavarnway behind the plate. Earlier this season, the Braves reportedly asked the Milwaukee Brewers about Jonathan Lucroy, but Milwaukee has been reluctant to deal the 29-year-old backstop, who last year was a National League All-Star and finished fourth in NL Most Valuable Player voting.